A significant number of Korean physicians and medical school students showed a keen interest in working in the U.S. as a doctor. 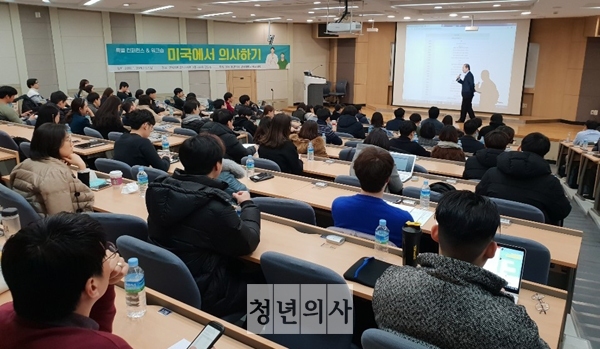 The “Working as a doctor in the U.S.” conference and workshop, organized by The Korean Doctors’ Weekly, the sister online paper of Korea Biomedical Review, and Yonsei University College of Medicine, on Saturday and Sunday, showed how much they are interested in a physician’s life in America. 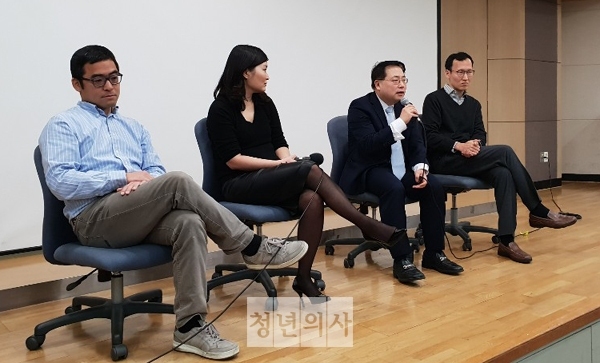 The Korean Doctors’ Weekly and Yonsei University College of Medicine hosted the “Working as a doctor in the U.S.” at the university’s grand hall in Seoul, Saturday. More than 130 participants carefully listened to the stories of four Korean doctors who were living and working in the U.S. Some of the participants were just admitted to med schools. The four doctors shared their know-how to get a job as a physician in the U.S. They were Kang Hyun-seok, associate professor of hematology and oncology at University of California San Francisco, Park Chan-wang, chief information officer at Anesthesia Consultants of Indianapolis, LLC, Jeun Hye-young, clinical assistant professor of emergency medicine at New York Medical College, and Cho Do-yeon, associate professor of otolaryngology at University of Alabama at Birmingham. The speakers offered practical information such as procedures to obtain a medical license in the U.S., the American system for trainee physicians, attainable visa types, understanding of matching and choosing a teaching hospital, actual life of a trainee physician, whether to pursue fellowship or not, and how to survive in and outside the academia. Cho Do-yeon (second from right), associate professor of otolaryngology at the University of Alabama at Birmingham, answers to a question by an audience member at the “Working as a doctor in the U.S.” conference at Yonsei University in Seoul, Saturday. From left are Park Chan-wang, chief information officer at Anesthesia Consultants of Indianapolis, LLC, Jeun Hye-young, clinical assistant professor of emergency medicine at New York Medical College, Cho, and Kang Hyun-seok, associate professor of hematology and oncology at University of California San Francisco. In a question-and-answer session, physicians and med school students asked them various questions such as how to improve English language skills and necessary experiences to become a trainee physician in the U.S.
After the conference, participants had a workshop in small groups to obtain personalized information through one-on-one counseling. During the workshop, participants submitted their CVs and personal statements to the four speakers and had interviews with them in English. The four physicians offered feedbacks and further explained about what to prepare when applying to become a medical resident in the U.S.